Tickets are $10 general admission, $5 for UChicago students. 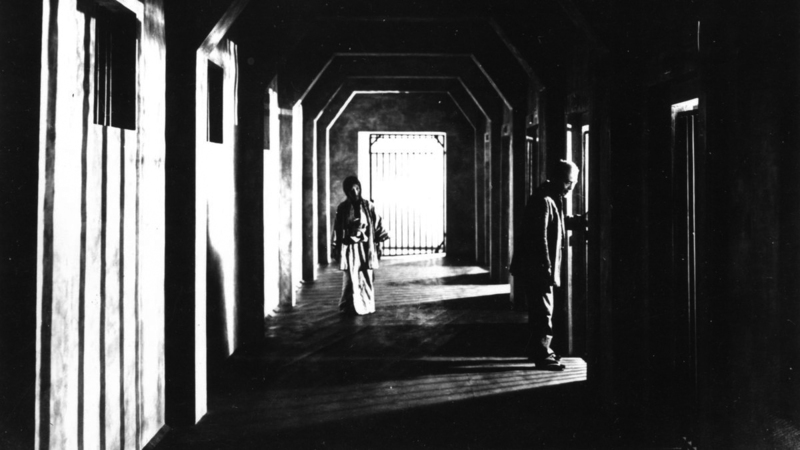 Lost for almost fifty years until director Teinosuki Kinugasa rediscovered it in his own warehouse, A Page of Madness was the product of a group of avant-garde artists (including future Nobel Prize winner Yasunari Kawabata, who wrote the original story) who called themselves the Shinkankahua, or School of New Perceptions. New perceptions is right: the disorienting film chronicles the slow descent into madness of a guilt-stricken sailor who takes a job as a janitor at an asylum to care for the wife he drove insane. As he loses his own grip on reality, the film devolves into disjointed, expressionistic fever dream that makes The Cabinet of Dr. Caligari look tame by comparison. Absent traditional intertitles or straightforward narrative, Alloy Orchestra's evocative score is our guide through this surrealist masterpiece. Alloy Orchestra is a three-man musical ensemble that writes and performs live accompaniment to classic silent films. Working with an outrageous assemblage of peculiar objects, they thrash and grind soulful music from unlikely sources. Performing at prestigious film festivals and cultural centers in the US and abroad (The San Francisco Silent Film Festival, The Telluride Film Festival, The Louvre, Lincoln Center, The Academy of Motion Pictures, the National Gallery of Art and others), Alloy has helped revive some of the great masterpieces of the silent era. An unusual combination of found percussion and state-of-the-art electronics gives the Orchestra the ability to create any sound imaginable. Utilizing their famous “rack of junk” and electronic synthesizers, the group generates beautiful music in a spectacular variety of styles. They can conjure up a French symphony or a simple German bar band of the 1920s.